Director / leading man Ben Affleck has clearly set out here to make a deeply Boston-inflected anti-hero movie, about a quartet of serious bank robbers and the ring-leader who wants to break away, but for my tastes, he leans too heavily on the anti- to make this film enjoyable. Doug MacRay and his cronies have grown up in Charlestown, the “Town,” which we’re told at the outset is host to more bank robberies than any other place in America. Perhaps that’s due to the deep-set “town and gown” conflict between the native townies and the imported Harvard yuppies. Affleck, whose relationship to Boston is akin to M. Night Shyamalan’s relationship to Philadelphia (which is to say, symbiotic), gives us all the grit and flattened a’s of the neighborhood, but by now, we’ve seen this story of lovable hoodlums crushed by their neighborhood a bit too many times. So when Doug falls in love with one of the victims of their latest bank heist (whom he’s been assigned to watch to make sure she didn’t see anything that would compromise them with the FBI), we can already tell where this story is going to go: Doug will become increasingly tangled up with Rebecca Hall’s Claire Keesey, which will begin to compromise him in the eyes of his friends. This will lead him to search for a way to break free of his life of crime (and “the town”), all while he’s being pulled back in for one last, big heist (and while being relentlessly tracked down by Jon Hamm’s smarmy FBI agent). Affleck has toned down and muscled up, and hired Academy nominee Jeremy Renner to portray his hot-headed comrade, so The Town is imbued with all the male self-worship and grunting athleticism of a neighborhood gym. It also lacks a realistic female perspective, as Hall’s character is a mere prop in Doug's eventual extrication of himself from his undesirable situation. But what it lacks in heart, Affleck makes up for in detail. The gang do their robberies in fun Halloween-style masks (the nun masks are particularly inspired), and Hamm’s FBI agent brings the right amount of cocky competence to give this “not-fooling-around” crew a genuine chase. 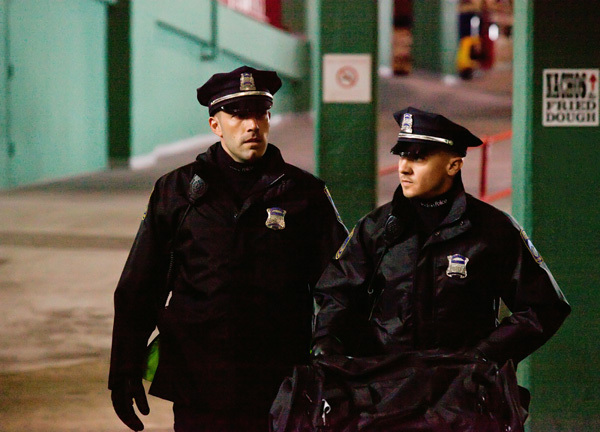 The final big heist at Fenway is also deliciously staged, with a series of cop uniforms that cause just the right amount of confusion. In fact, what’s most interesting about the film is the series of blue-color costumes that the crew goes through, including not only cops but EMT and transit workers. They are the masks of the invisible crew of working-class men who keep the city operating, and the fact that Most Wanted can camouflage themselves into the background by simply donning them is a great statement about how the “townies” are ignored by the society around them. If only Affleck had found a way to make more of that idea. Instead, the final set-up has Doug's partners essentially sacrificing themselves once again because Doug's greater intellect and star power needs to come away unscathed. It borders on Affleck worship and given that he’s directing, it’s slightly disturbing. Doug is far from a nice guy – he’s a murderer and a punk – and unlike, say, "The Sopranos," where murderers and punks may seem like your nosy neighbors but eventually get what’s coming to them, The Town posits a morality where ethics applies to everybody but the hero. You know from the start that Moss’s character will feel betrayed – neigh, practically raped – when she finds out that the guy who’s seduced her is the same one who kidnapped her at a bank robbery a week before. The only mystery is how Affleck, in the story telling, will maneuver things so that she’ll forgive him. That she eventually does so is not only unrealistic, it’s a bit disgusting. That The Town leaves you feeling dirty is no doubt the effect Affleck was going for, though I doubt he was after it in quite this way.